The holdup surrounds a failure to secure sufficient support from senior ministers, with Downing Street hoping to publish the document on Thursday after briefing Brussels on its content. Mrs May’s new arrangement plans to keep the UK remaining closely tied to the EU for an indeterminate period of time at the end of the transition period in the hope a new customs fix would emerge as the answer for the Irish border question. Preventing a hard border on the island of Ireland has become Brexit’s most divisive topic, with Irish prime minister Leo Varadkar warning the issue could derail the whole process. The Prime Minister’s plans to keep the UK aligned to Brussels for an indefinite period is her latest attempt at winning over the EU27, but has faced domestic stumbling blocks while trying to the win support of her so-called Brexit war Cabinet. David Davis is at the heart of the blockage with his refusal to backdown and a demand for a time-limited plan. The disagreement has sparked rumours that the Brexit Secretary is planning a shock resignation, however, sources close to the senior minister have denied any possibilities of quitting office. Other Brexiteers are also preparing to confront the Prime Minister at a meeting of her Brexit war Cabinet on Thursday. Former Brexit minister David Jones has warned the UK’s EU divorce would become “deeply dangerous” without his former boss Mr Davis at the helm. Mr Jones told the BBC: “Negotiations continuing without David Davis would be deeply upsetting and deeply dangerous for the country. Meanwhile, in Brussels, EU officials are happy to let the drama in Westminster play out while they wait for any proposals to arrive on the negotiating table. The EU’s team had expected the document to be at least presented to them on Wednesday as part of the week’s negotiations. However, even if Mr Davis is able to convince the Prime Minister to offer a time-limited Brussels would likely turn it down. While things are moving on in negotiations, the EU’s hopes for the June summit, where leaders of the EU28 will meet, have been significantly scaled back with many resigned the Irish border debate will rumble on into October. 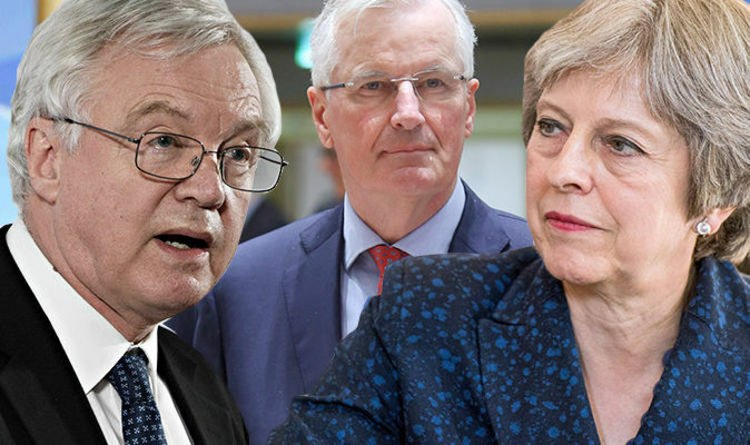 Nonetheless, the EU’s chief negotiator Michel Barnier is expected to hold a public briefing on Friday before Mr Davis travels to Brussels on Monday for a private meeting with his counterpart. The Frenchman is likely to treat Friday’s address as a “soft landing” for any proposals ahead of the June summit. Mrs May has held “constructive” talks with Mr Davis and expects him to remain in his post, Downing Street has said. The Prime Minister also held separate face to face meetings with Foreign Secretary Boris Johnson and International Trade Secretary Liam Fox. The meetings took place in her parliamentary office, the one with Mr Davis was the longest, believed to have run to more than 30 minutes. The Prime Minister was forced to stem a crisis engulfing her Cabinet after hard Brexiteers claimed plans to stop a hard border on the island of Ireland could keep Britain tied to the EU indefinitely. Mr Davis was so incensed that the proposal would not be time-limited there were fears he would quit, spelling chaos for Brexit negotiations. Mrs May’s face-to-face crisis talks were also held with Foreign Secretary Boris Johnson and International Trade Secretary Liam Fox. Her discussions with Mr Davis, in her parliamentary office, are understood to have lasted more than 30 minutes. Her spokeswoman said Mrs May expects Mr Davis to still be in his post by the end of the day. A new proposal for avoiding a “hard border” is expected to be published today following weeks of wrangling. But a furious row was understood to have broken out between Cabinet factions yesterday after a draft document failed to stipulate when the fall back mechanisms would expire. 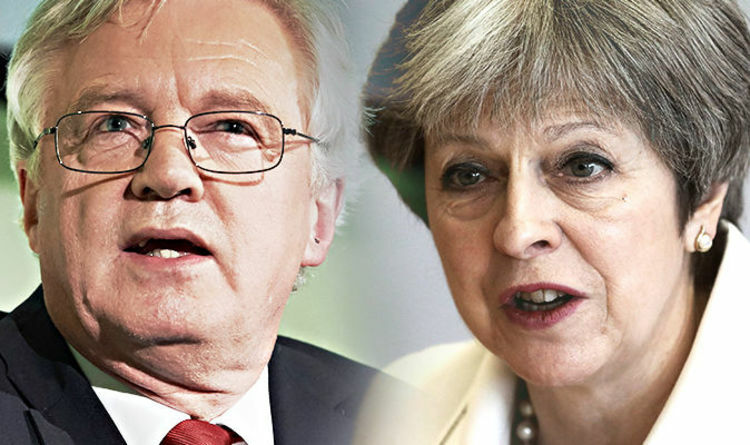 Mr Davis was believed to be among ministers critical of the draft which sets out a blueprint for a temporary customs union – if technology for a “frictionless border” is not ready in time for the end of the Brexit transition period in December 2020. He signalled that he would hold Mrs May to a previous promise that the “backstop” would have an expiry date. “On time limits, I think the Prime Minister has already made public the fact that we expect to put a time limit on the backstop proposal,” he said after delivering a speech in Westminster. The Prime Minister’s Cabinet sub-committee are meeting today to try to thrash out the backstop proposal. Speaking in London, Davis hinted at his frustration at the delay at publishing the white paper on Brexit. He played down suggestions that he could quit over the row. Former Brexit minister David Jones warned today the EU Exit Secretary’s exit from the Government would be “deeply damaging” to the country”. Foreign Secretary Boris Johnson was also thought to have had concerns about the proposals. Mrs May yesterday told Prime Minister’s Questions she expects the transition from the EU will be completed by December 2020. She refused to commit to a date for the publication of the key negotiation document. Mr Davis ratcheted up pressure on the EU yesterday over a post-Brexit security deal. 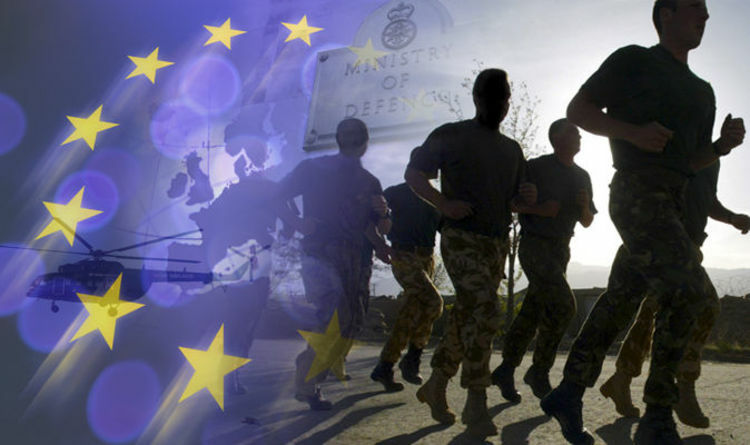 In an opening salvo ahead of the next round of face-to-face talks over the UK’s departure from the EU, the Tory Cabinet minister hit out at European Commission negotiators for trying to put conditions on future military and counter-terrorism cooperation. “Any move by others to place conditions on our offer will only serve to put the safety of everybody’s citizens at risk,” he said. He also savaged Brussels for trying to freeze the UK out of the pan-European Galileo satellite navigation system. “Put simply, the Commission’s position seems to be shooting itself in the foot just to prove the gun works,” the EU Exit Secretary said. Jean-Claude Juncker’s European Commission is trying to sideline Britain by launching its own space agency which would leave us out in the cold – and ensure Brussels has control of civil and military satellite systems after Brexit. But scientists keen to separate themselves from the petty world of politics have stressed they want to usher in a new era of cooperation – and that includes working side-by-side with highly qualified colleagues based in Britain. Jan Wörner, director-general of the European Space Agency (ESA), which is an inter-governmental organisation which includes the UK as well as Canada and Norway, in addition to all 27 EU member states, believe the commission’s plan will be costly, divisive and unnecessarily bureaucratic. Writing in his latest blog, Dr Wörner explained: “Europe, this is to say at least the EU, ESA and their respective member states together, must join forces. 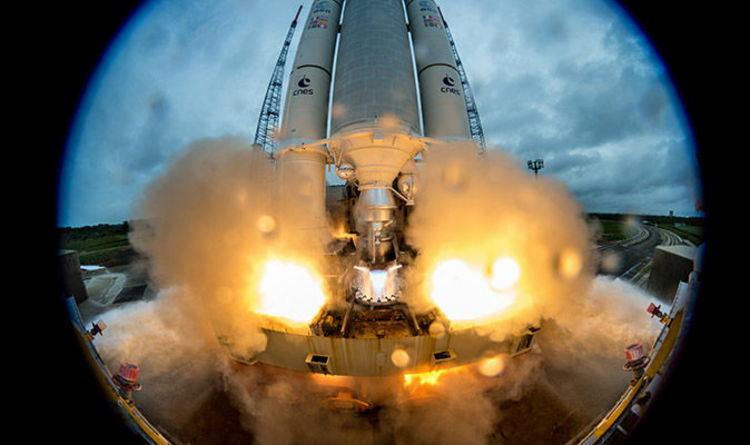 “There is no need to develop a new space agency in parallel in Europe, the ramp-up of which would take decades and cost billions and would therefore in itself be a major risk to the programmes it manages. “We need to streamline, not double administrative layers. “Therefore, let us think European, I mean really European. “Astronauts always report that they do not see any national border in Europe. “In that sense we should work for United Space in Europe and for the other way around, namely for United Europe in Space. Proposals published yesterday outline plans whereby the EU would take direct control the civil-military Galileo and Copernicus satellite projects after 2020, relegating the ESA to a technical and advisory capacity. Britain is lobbying to retain access to Galileo’s Public Regulated Service signal, used for military purposes, on security grounds. Instead, Eurocrats envisages control of the satellite projects becoming an “EU agency for the space programme” with contracts only issued to EU member states. However,Bleddyn Bowen, a space policy researcher based Leicester University, said said Brexit appeared to “accelerating the process of dovetailing ESA into EU space policy”. Brexit Secretary David Davis has accused accused the Commission of “shooting itself in the foot just to prove that the gun works”. 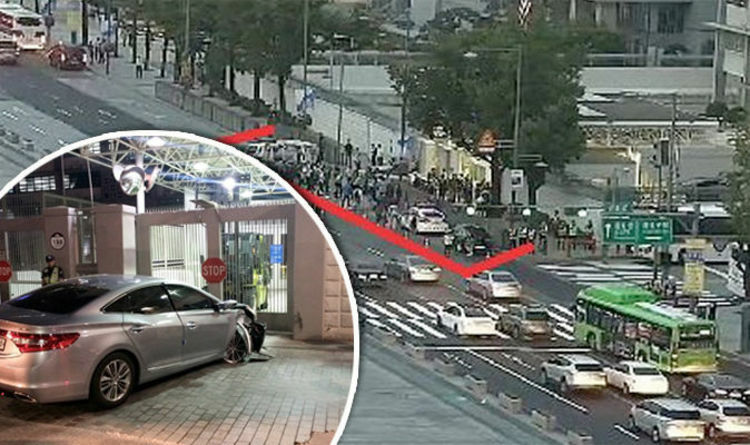 Pictures from the scene show a car with its front badly damaged after it ploughed into the gates of the embassy. Unconfirmed reports said the man fell out of the vehicle before yelling “help me” several times. The former Tory leader took a huge dig at France and said that under a no deal Brexit the World Trade Organisation (WTO) must protect the UK from France “deliberately delaying the transfer of goods”. Speaking on BBC Radio 4’s Today programme, Mr Duncan Smith said: “My general view is they should anyway plan for delays. 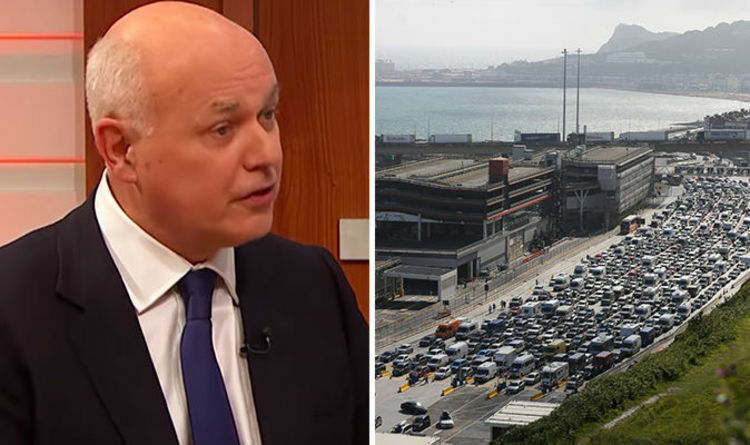 Mr Duncan Smith said Britain must be making arrangements for a no deal Brexit after a leaked civil service report claimed the Port of Dover would ”collapse on day one”. He said: “Planning for those things is quite sensible anyway. But the way, the way that the ports in the European Union operate isn’t always exactly the same. “For example, the Belgium and Dutch ports are often much more efficient and more fluid about getting stuff through. And you rarely get delays on those ports. Leaving under a no deal Brexit would mean Britain falls back on WTO rules, which would mean checking what goods are passed through borders and making necessary payments for exports. Mr Duncan Smith insisted Britain must plan for a no deal Brexit – suggesting the WTO would need to check France would not deliberately introduce punitive customs checks. He said: “Under the WTO it is quite illegal for a country like France to put bureaucratic arrangements in place that deliberately delay the transfer of goods. “It’s illegal. You can’t do that. That is a hidden border check and that shouldn’t be done. So, there are lots of things. “Yes, of course, we don’t want to leave without a deal because we’d like to see that frictionless process as frictionless as possible. He insisted there are lots of things to make the border crossing process faster, saying: “The WTO rules do not specify that you have to check everything. Civil servants have been drawing up scenarios for a “Doomsday Brexit” that would lead to shortages of medicine, fuel and food within a fortnight of leaving. A report, cited by the Sunday Times, said there are scenarios for mild, severe and “Armageddon” reactions to no deal exits. The newspaper quoted a source who claimed a severe no deal scenario could lead the Port of Dover to ”collapse on day one”. Addressing claims made in the leaked Whitehall report on Monday, Theresa May’s official spokesman said such forecasts were “completely false”. He added: “We know that none of this will happen. We have always been clear we are planning for all scenarios and we will be fully prepared. However they have now been told by Brussels will not have their roles with the EU automatically renewed after Brexit. 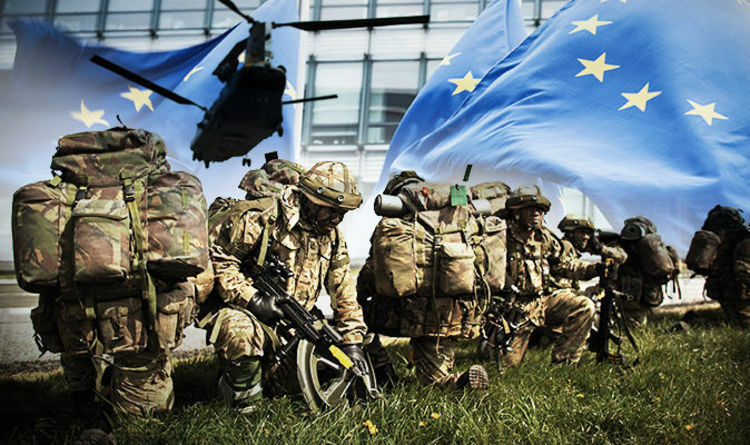 The Ministry of Defence said British secondments are now being considered by Brussels on a case-by-case basis in a bid to stop conflicts of interest in potentially sensitive areas. But joint military missions could face issues after Brexit and a top British official urged negotiators to “find a way to keep the door open”. Air Chief Marshal Sir Stuart Peach, the chief of the UK defence staff, told the Financial Times: “At times like this the military to military relationships matter more than ever. “The history and geography of our nation doesn’t change because of Brexit. “We have to find ways of working together with our European friends and partners. However, the EU’s chief negotiator Michel Barnier has criticised the UK’s internal security requests for co-operation, comparing Britain to a country “at the beginning of an accession process” to join the EU. A senior EU official also recently accused the UK of having “a lot of appetite for the secondment UK officials” into EU bodies “which would require the EU to change its rules again”. The Ministry of Defence said there are “challenges surrounding new applications and extensions” of secondments although a spokesman added he was confident there are no present restrictions to the UK’s ability to second officials during the transition period. The UK has a similar military arrangement with the US where Britain has around 200 personnel embedded in or on secondment and there are also about 135 exchange officers. The news comes after sources in Westminster revealed Theresa May expects to present the EU with a new divorce plan following a meeting with her Brexit Cabinet on Thursday. It is said Mrs May’s senior EU advisor Olly Robbins will to travel to Brussels to formally present the plans to his EU counterparts which will hopefully solve the ongoing Irish border conundrum at the end of the week. And Express.co.uk understands the EU’s chief Brexit negotiator is planning for a press conference after Friday’s negotiations, which are billed as a “wrap up session” but could involve Brussels officially agreeing to the UK’s plans.